The Grey Blu-ray Review. Initially, ‘The Grey’ looks like it’s going to tuck itself neatly into the stereotypical mould for monster movies but it's quite more. It doesn’t last long, but the plane crash sequence at the beginning of ‘The Grey’ is easily the best part of the film. It’s here that writer/director Joe Carnahan throws everything at you; it’s sensory overload, and it works. You get the feeling that a large part of the film’s budget went on putting this one convincing and terrifying sequence of shots together. Liam Neeson plays John Ottway, a hunter who has been employed to track and kill the wolves that threaten workers in the Alaskan wilderness. When Ottway survives a plane crash, along with a handful of his fellow workers, he becomes an instant expert. Those wolves are out for blood, and won’t be satisfied until none of the encroaching humans remain on their patch. The background of Neeson’s character is kept deliberately sparse, and the viewer is asked to do quite a lot of heavy lifting in order to piece the story together. This gives the movie a very stark, ‘here and now’ feel which works particularly well. It’s a shame that the final scene is handled so clumsily, and the film-makers choose to spell things out to the audience through some crude dialogue choices. There are plenty of visual clues in the scene, so why not treat the viewer with some modicum of respect and let them work it out for themselves? Initially, ‘The Grey’ looks like it’s going to tuck itself neatly into the stereotypical mould for monster movies. There are certainly plenty of scarier moments, and the cast of characters are whittled down with alarming speed and ferocity, as you’d expect. But it quickly becomes clear that gore and cheap thrills aren’t the focus here. 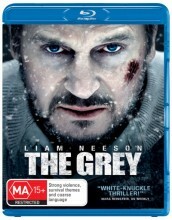 ‘The Grey’ is more of a psychological journey. The pack of wolves are just one facet of the battle being waged inside Neeson’s John Ottway. There are themes of life and death, cold reality versus inner faith. One powerful moment has Ottway screaming at a white-washed sky, demanding that God give him a sign. The cold, cruel Alaskan wilderness is an inspired choice of setting, and the perfect place for these battles of heart and soul to take place. Most of the exterior shots have a persistent graininess to them, and this suits the overall mood of the film. The soundtrack hits all the right emotional notes: Soft, lilting music accompanies Ottway’s flashback moments, whereas the scenes in the wilderness are genuinely frightening. You’ll be subjected to the constant heckling of the wolves, and just like the characters, living in constant fear of the next attack. There are 3 Featurettes on the disc. Each of them runs for only a couple of minutes, and they have the look of teaser trailers rather than genuine ‘behind the scenes’ footage. The Extemes: A short film which explores the hardships of the environment in which the movie is set. Into the Fray: This one talks about the story itself, and key performances. Man Versus Nature: A look at the antagonists of the movie, the wolf pack, and their environment.